Rockfish are remarkable animals. The genus includes 28 of the Salish Sea’s 253 fish species, and their slow-growing, late-maturing, long-living, stay-at-home lifestyle is ideally adapted to our deep, rugged underwater habitats. With cryptic coloration and poisonous spines helping to keep them safe from predators, adult rockfish also have a low natural mortality rate, allowing them plenty of time (some species live more than 100 years!) to grow into large, prodigious breeders. Unfortunately, rockfish ran into a snag when humans came along. They’re easy to catch, taste delicious, and those same life strategies that make them so successful under natural conditions also make them very vulnerable to overfishing. The biggest, fattest, oldest fish that serve as the best babymakers are also the lunkers so highly prized by fishermen. Since the mid-60s, our overall rockfish population has crashed by 70%. Wildlife managers recognized the problem decades ago and began attempts to halt the decline. SeaDoc has long been heavily involved with rockfish issues and we continue to work closely with recreational fishermen, charter guides, and scientists from our local tribes, universities, NGOs, and all levels of government on both sides of the border in order to provide the best science possible to inform management decisions. 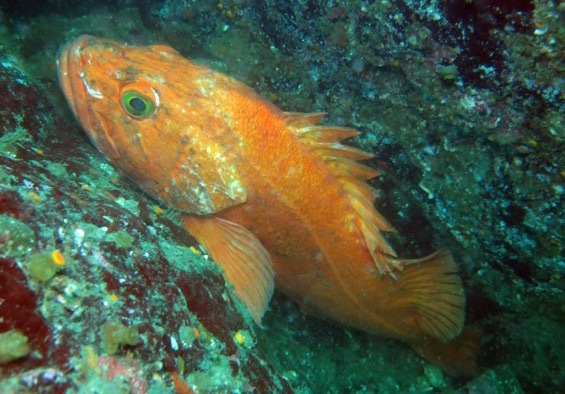 After looking at the science, thirteen rockfish were listed as Species of Concern by Washington State, which enacted commercial and recreation fishing bans. In British Columbia, the government set aside Rockfish Conservation Areas (RCAs). At the U.S. federal level, the big guns were pulled out in 2010 when three species of Salish Sea rockfish—yelloweye, Boccaccio, and canary—were listed under the Endangered Species Act. DNA research has since shown that our canary rockfish are part of the same population as the coastal canaries so they’ll likely be removed from ESA protection, but our yelloweye (Sebastes ruberrimus) and Boccaccio (Sebastes paucispinis) Distinct Population Segments remain listed, respectively, as threatened and endangered. 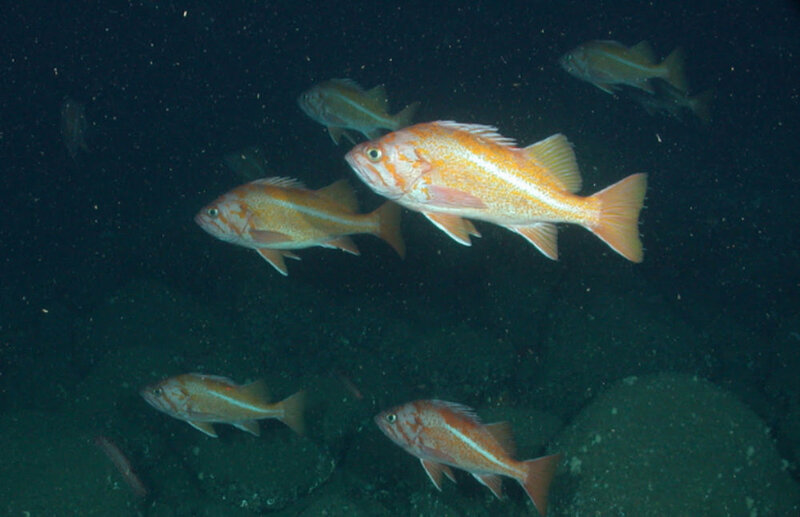 Canary rockfish photo by NOAA. ESA listing requires NOAA Fisheries to come up with a plan to keep the affected species from going extinct. Drawing on studies (by SeaDoc and many others), they’ve come up with a Draft Rockfish Recovery Plan. The plan includes about 45 recommended actions, including doing a lot more research to better understand the rockfishes’ critical life stages (see our monthly update where divers are finding YOYs) as well as the threats they’re facing such as death by accidental bycatch and derelict fishing gear, water quality problems like persistent organic pollutants and low oxygen levels, and habitat issues including kelp restoration. While all the stakeholders agree they want to see the return of healthy rockfish populations, if there’s one aspect of the plan sure to be a hot-button issue, it’s the call to start the separate public process for creating RCAs, MPAs (Marine Protected Areas), or some other form of marine reserves in the San Juan Islands and eastern Strait of Juan de Fuca where NOAA has identified a high risk of rockfish bycatch. Marine reserves have been shown to help fish populations, especially with long-lived, resident species like rockfish, but some recreational fishermen believe the regulations already in effect do enough to protect the yelloweye and Boccaccio. What do you think? NOAA wants to hear from you, and you can comment on their plan here until November 14. Along with taking comments, NOAA will be holding public meetings on the rockfish plan (more information and meeting schedule here). To arm yourself with all the info before you comment or attend a meeting, settle back, put your fins up and dive into the complete 157-page plan and its 83 pages of implementation appendices. It’s interesting reading, and chock full of facts about rockfish and their Salish Sea habitat. Scientists who showed how copper damages salmon's sense of smell and helped create legislation to remove copper from car brake pads are honored with the prestigious Salish Sea Science prize. 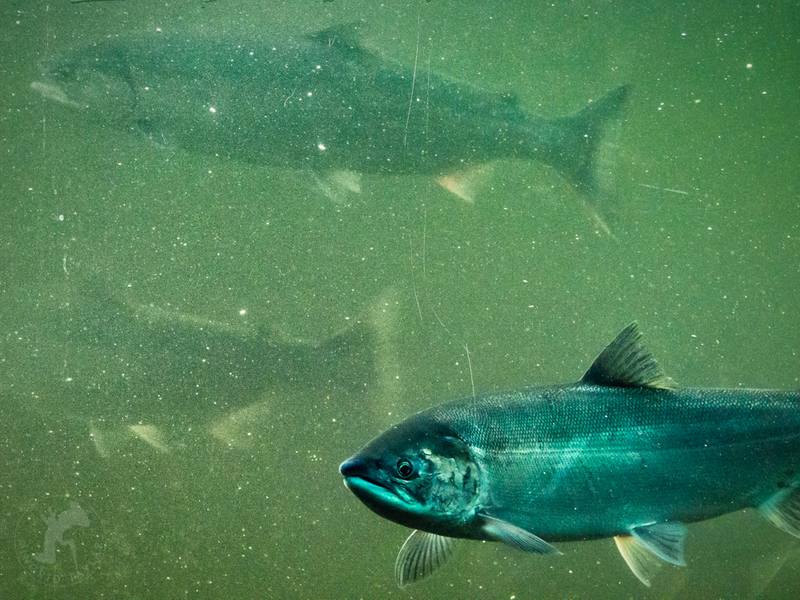 A team of U.S. scientists will be awarded the SeaDoc Society's prestigious Salish Sea Science prize this week for groundbreaking research they performed demonstrating the impacts of copper to salmon. Read the full story in The Islands' Sounder.